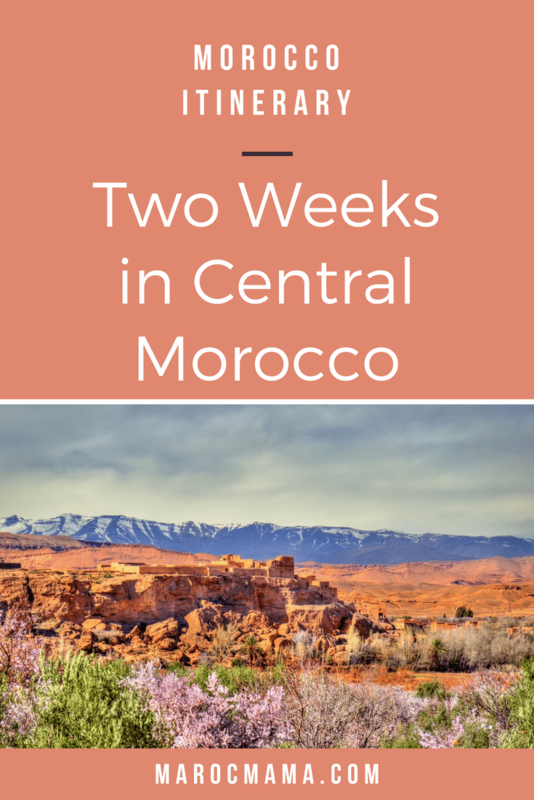 If you have 2 weeks in Morocco, you’re in luck because you can cover a lot of ground! 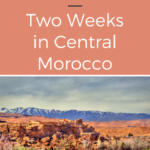 In this post I’ve put together an itinerary that will take you through central Morocco to explore some great destinations. While there are recommended times for each location, you should feel free to add, delete and extend or reduce the amount of time in each depending on what you want your holiday to look like. 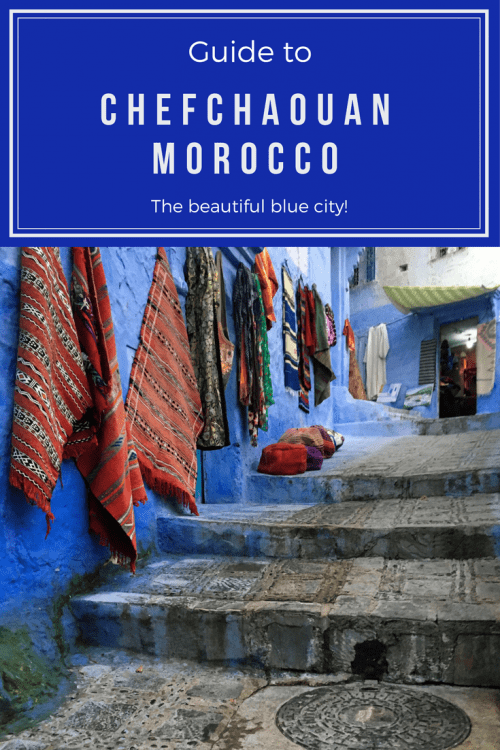 This itinerary includes some of the major highlights including a visit to the Sahara desert but also the coast of Morocco. You’ll get a little bit of everything; cities, rural Morocco, the beach, the mountains and the desert! There are multiple airlines serving Menara Airport, Marrakech. One of the perks of arriving here, is to view the beautiful architecture of the building itself serving a visual reminder you’ve landed in the land of natural and design beauty. Direct airport transfers from your riad or hotel will save you time and energy and give you the luxury of a driver awaiting your arrival at the arrival exit. If you decide that you’d rather make your own way then know taxis to the medina are a flat rate of 70 dirham, there is a large sign posted by the taxis that you can consult to verify this – chances are good the driver will try to charge you more. If you are staying out of the medina you may need a grand taxi. Know that rates outside of the medina will be higher. There is also a bus that runs from the airport to Jemma el Fna and costs 30dh. On your day of arrival, allow time to immerse yourself in the sensory pleasures of Marrakech. Relax in your space, adjust to the time-zone and energy of the location, and soak in the sounds of the City. Meander in the Medina and Souks. The street scenes is a story and destination in itself. Allow yourself a few hours to wander and rest without an agenda. Starting off in the Jamaa el-Fna square, your curiosity will be peaked at every turn. Trust that no matter where you’re wander takes you, there will be a a trusted guide to ask for directions (ask in stores and don’t accept the guidance of those who will approach to ‘show you the way to the square’). You’ll be drawn into almost every shop in the souk (by choice or eager sales assistants calling you in) but try to simply browse and take it all in first. You’ll be able to come back again to shop later (and there’ll be occasion on the route to buy at a cheaper price). The ancient 14th century Islamic college. It’s even more magical if you arrive to hear the prayer call (adhān) while standing in the enclosed square with the prayer echoing into the sky. (Note: this is currently closed until 2020 for renovations). …at Le Jardin or La Ferme Medina if you’re in the area around Ben Youssef to give you a slice of tranquility in the chaos of the medina scenes. If you prefer something a little more lux with a pool view, head to Palais Dar Donab not far from Terrase des Epices. If you’ve already headed towards the Mellah area to visit the Palais, lunch at La Famille on route (but be sure to arrive early as it fills up fast). 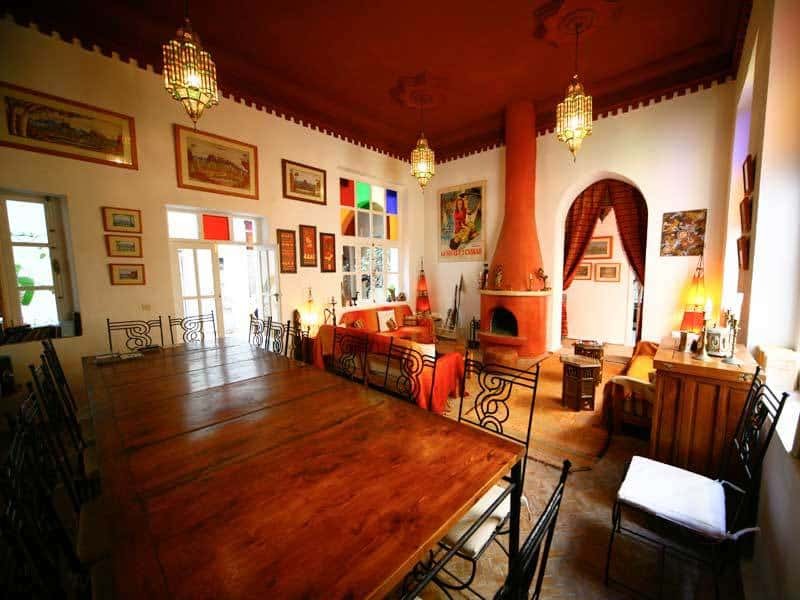 Palais Bahia, Palais Badi and the Mellah in the Jewish area of town if you prefer to snap up more historical and cultural beauty, or if contemporary design is more your scene, take a taxi to Jardin Majorelle and YSL museum in the new town of Gueliz. if you prefer time to rest and experience the wellness rituals of Marrakech. You’ll likely want to nap after, so plan time for this before dinner. From a rooftop cafe overlooking the Jamaa el-Fna Square where you’ll be able to photograph iconic scenes in peace. 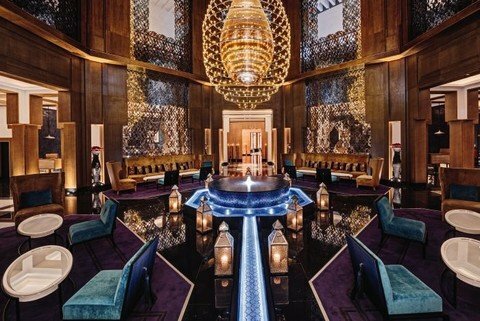 You could take a dinner at Nomad for a sunset view of the mountains and spice markets before heading into the hustle and bustle and be part of the performance of the iconic Square at night. Allow your eyes and mind to open with the stories you’ll see and want to absorb to later share or tell. Let your memory record it all, rather than with your phone or camera as you’ll be more present and stand out less too! View our Ultimate Planning Resource for Marrakech for places to eat, shop, stay or visit. A beautiful and affordable riad in the medina for your stay in Marrakech! 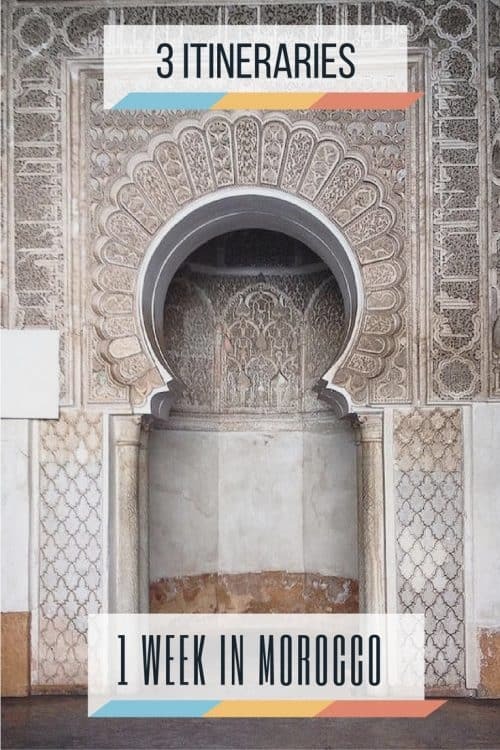 A beautiful luxury riad in the heart of the medina a stone’s throw from the Ben Youssef Madrasa. Located in Hivernage (near the medina) this hotel offers modern amenities within walking distance to the medina. Within a 3-hour drive from Marrakech, you can experience the cool breeze and sandy stretches of beaches along the Atlantic Ocean. An unexpected highlight on the way is the rather gorgeous La Fromagerie restaurant and guest house where every dish is lovingly prepared with freshly pasturized cheese made on site. On arrival in Essaouira you’ll notice the contrasting laid back vibe, colorful streets, the sound of seagulls and the blustery wind! Take a mint tea and relax. The town is small and you’ll see everything in time, so give yourself a chance to do nothing but people watch and rest. Breathe in the ocean air and lunch on the port. Compared to the noisy streets of Marrakech, it’ll be a welcome dose of calm. You’ll be able to saunter along to the port and take a tour of the fishermen stalls to select fresh fish you can have grilled for lunch. The locals are happy to advise on where to do this. If you prefer something a little less rustic, the recently opened BistrO Essaouira is a good option or La Terrasse by Taros is a popular choice with local expats and tourists (they have live music at night too). Visit the scenes of Game of Thrones. You might have already toured the old Jewish quarter or mellah in Marrakech but notice the quiet contrast of the mellah of Essaouira. Long since abandoned, you’ll see the skala ramparts that make up the walls of the Portuguese fortifications which were used as a filming backdrop to the popular TV show. Dinner at Umia. One of my favorite restaurants in Morocco, we recommend a visit here if they’ve availability. Be sure to book ahead. Alternatively, if you’ve booked to stay in the design sanctuary of Villa Anouk, book a 3-course dinner in the luxury of your home. The attention to detail in the table setting and customer service will make you want to book here for a longer stay. The indoor pool and hammam is also a welcome treat after a busy day. Walk or ride along the beach. Whether you want to stroll by foot, camel, horse or quad bike, you can experience the expansive sandy beaches with ease. If the sun’s out, why not take a swim or find a sun lounger and switch off from the world. Shop in the souks. 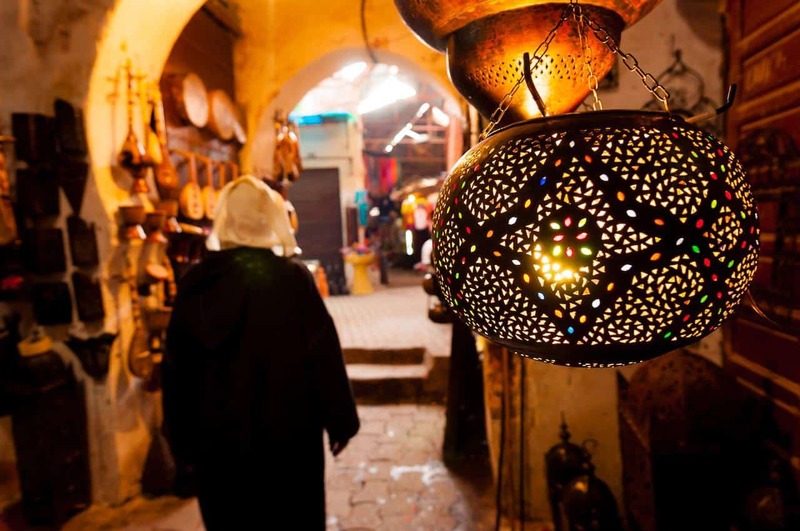 After being energized by the fresh air stroll, you might fancy a little stroll in medina and souks. Without the volume of tourists or scooters, you’ll find your way easily. You’ll recognize much of what you saw in Marrakech, but with less crowds to distract you from choosing. Lately raffia shoes and bags seem a popular choice here. Take a cooking class with a local. We highly recommend Khadija’s Kuzina cooking school where her energy will lift you and you’ll be able to commune and eat what you’ve cooked. Read my complete guide to Essaouira for even more info! 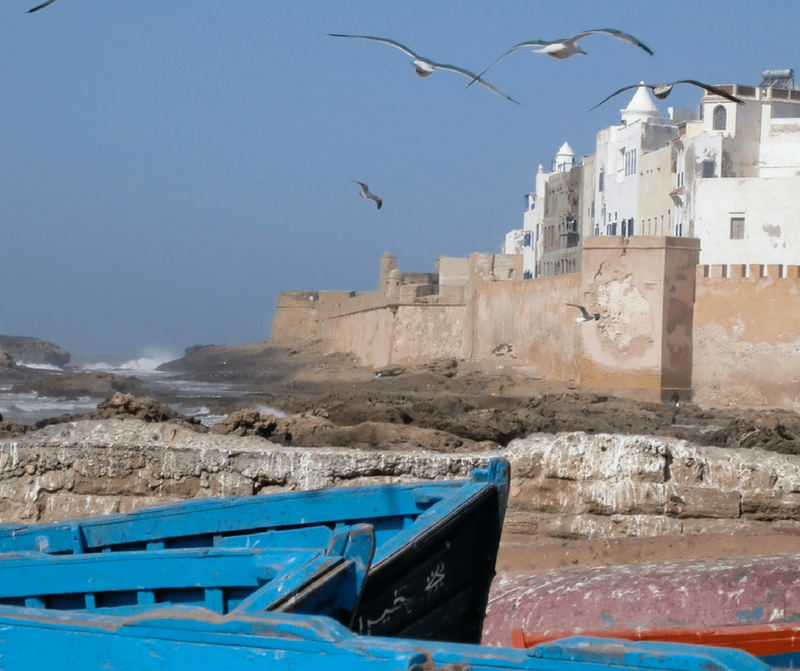 Read our full guide to the Essaouira to Agadir coastline to prepare for the next segment! Our favorite riad in Essaouira where you’re sure to be treated well and have a most relaxing stay! A good option for families visiting Essaouira, you’ll be able to enjoy this centrally located riad. 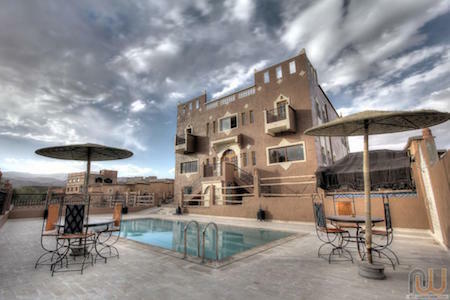 Located outside the medina with a beautiful pool and fantastic on-site restaurant this is a great spot to get away. After your stay in Essaouira, you can head down the coastline to Taghazout taking in the scenic surf and fishing villages along the way. The drive itself will become part of the journey as you stop to view the panoramic views of the ocean. Imsouane and Sidi Kaouki are both small, rural surf and fishing towns perhaps reminiscent of what Essaouira would have been before it’s rise in popularity. One of the highlights of both options, is the access to open waters and wild waves to take a surf lesson if you’ve never tried, or if you’re already a seasoned pro, you’ll be able to enjoy the water without the crowd. You’ll experience an authentic taste of local life where the pace is fairly sleepy. 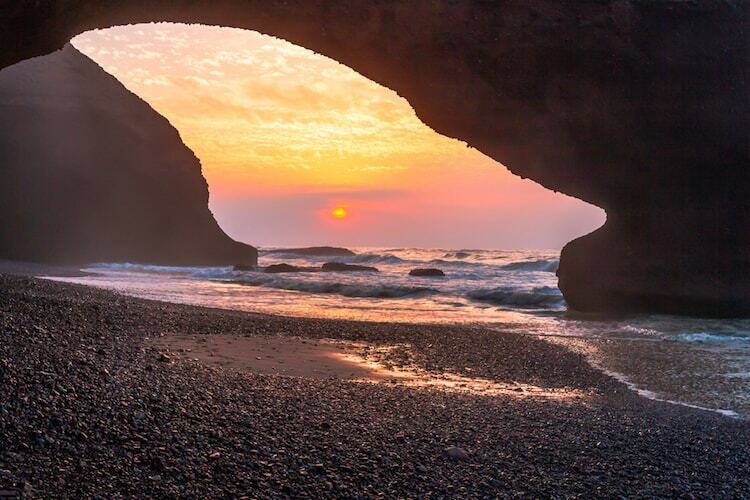 If you’ve still got energy, we suggest you continue traveling down to Taghazout where the accommodation is a lot more remarkable. 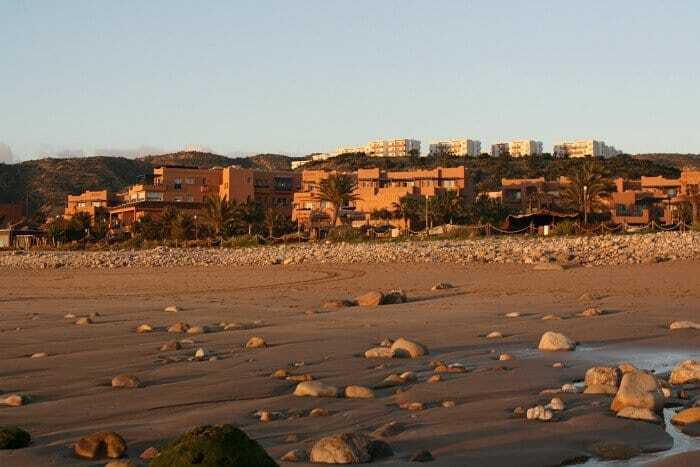 Another popular surf village, it has a developing wellness and creative scene taking advantage of the waves, low prices and surprisingly cool accommodation choices. 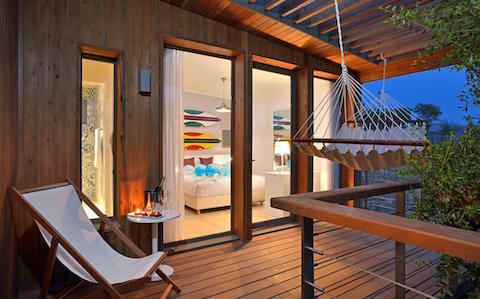 Stay here for a chance to surf, dive and fish or try their onsite restaurant. 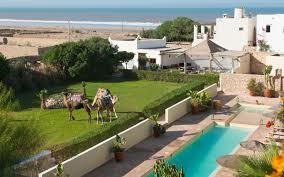 Located in Sidi Kaouki there are five properties to choose form and food is tailored to guest needs by the chef. Book a bungalow only 5 minutes from the beach, but it also has its own quiet outdoor pool and spa facilities and evening entertainment. Our favorite place to stay in the area. 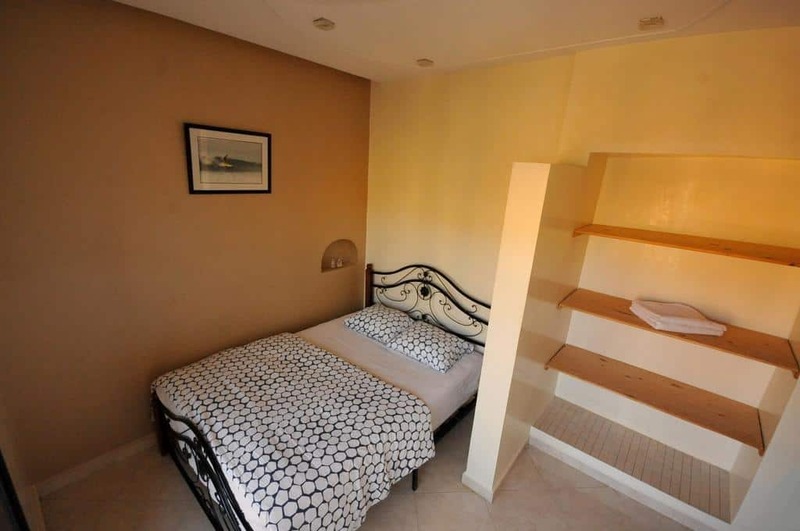 Similar to Sol House, they also have onsite restaurants, spa facilities, and a kids club if you’re traveling with kids. Not to mention surf lessons and a great pool. The most luxurious option in the area the new Hyatt Place offers the conveniences and comforts of a major hotel chain. You’ll be able to continue to explore the little town of Taghazout before you head off to Agadir or Paradise Valley for the day. It doesn’t have the iconic historical places of interest but it’s marina and beaches make it worth a visit if in the area. The Paradise Valley cascades are worth visiting when here where you’ll be able to swim in the river pools framed by gorgeous palm trees and mountain views. 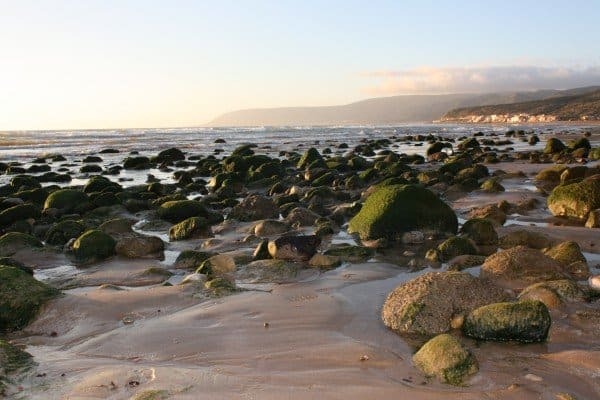 You’ll get a sense if Agadir is for you and whether you’ll want to stay the night or travel directly to Ourzazate to stay overnight there too. Read our full guide to Agadir for more tips and where to stay. 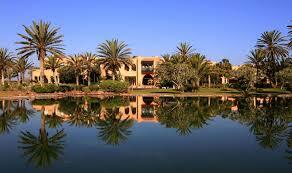 A good luxury hotel choice with an on-site restaurant, guest gym and spa, pool, as well as a access to the golf course. 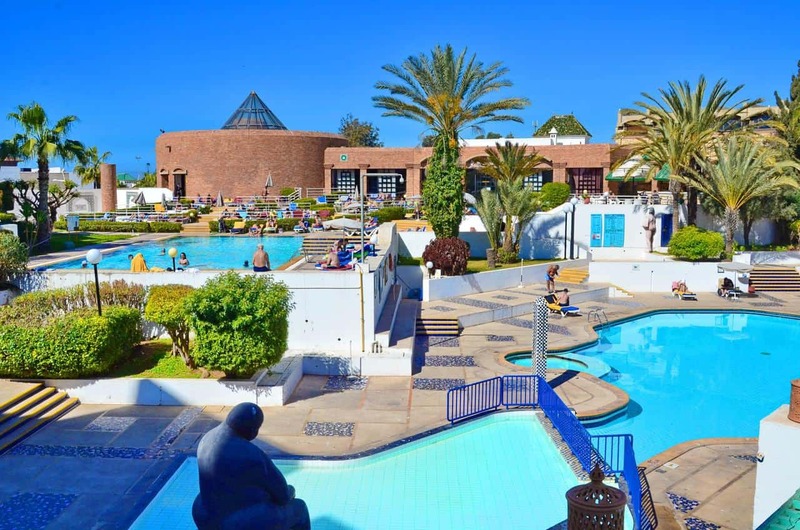 An all-inclusive, family friendly place to stay when you’re in Agadir. Ouarzazate may not be a name you recognize but you most likely will recognize it from major movies like Lawrence of Arabic (1962), Gladiator (1999), or The Mummy (2017), all who filmed scenes there. If you’re traveling from Agadir to Ouarzazate you should plan to spend a good 6 hours in the car as it is a bit of a ride. If you’d rather break up your trip we suggest a stop in Taroudant along the way (about 1 hour and 30 minutes from Agadir). Explore the medina, see the fortified walls and enjoy a meal at Riad Maryam (call ahead) which has a great reputation for excellent food. 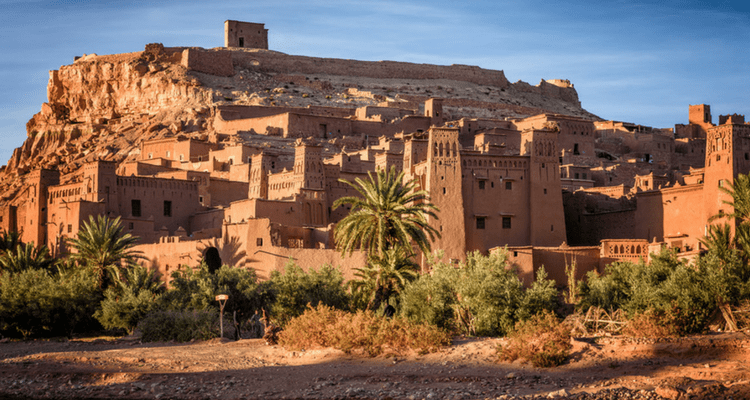 Once you head on to Ouarzazate you’ll want to know what to do. 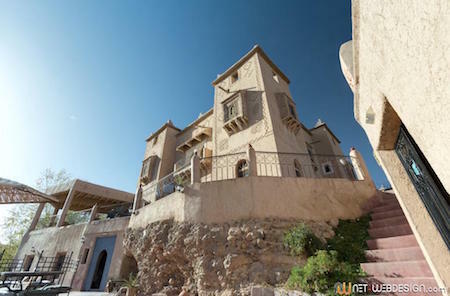 Kasbah Taourirt which houses a 19th century palace and has views of the rocky landscape used in films like . Cinema Studio Atlas (the first film production site in North Africa) has been a temporary home to Hollywood film stars and flocking tourists since 1983. Cinema Museum opposite the Taourirt Kasbah was a former studio and is an alternative introduction to the cinema scene here, if time or energy doesn’t allow for a drive to the museums out of town. Place Al-Mouahidine is where you’ll be able to take an afternoon tea and patisserie at Patisserie des Habouss in the quiet town square and people watch, yet again! The Ksar Ait-Ben-Haddou is a traditional pre-Saharan habitat in the Ounila Valley. Classed as an UNESCO world heritage site, it represents the 17th century valleys of Draa, Todra, Dadès and Souss. La Kasbah des Sables is recommended for an evening dinner in Ouarzazate. 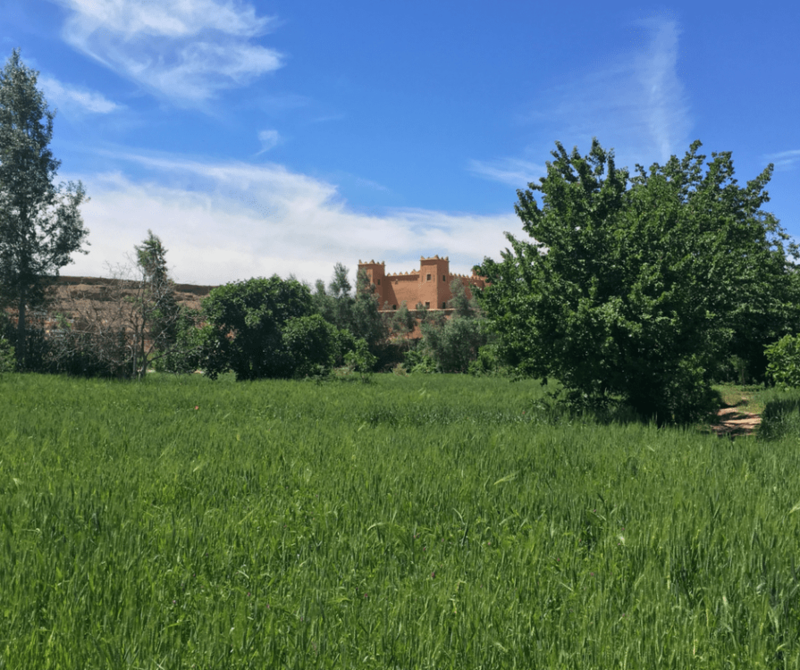 Read our full guide to Ouarzazate for our recommended places to stay. In the heart of the film studio this is a good option if you also want to tour the film studio (it’s included!). 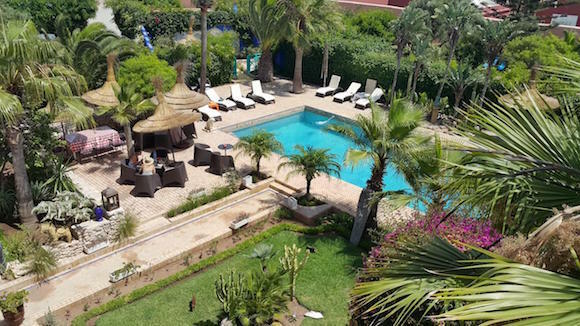 Just up the road from Ouarzazate this lovely guesthouse is ideal for relaxing in the palm grove! Depending on the date of your visit you’ll be able to visit the Festival of the Roses (25 May to 9 June, 2018) in the Valley of the Roses on route to Dades Valley. The dates for the festival are never fixed but if you want to see the fields of roses, you’ll want to arrive BEFORE the festival which happens once the harvest is complete. This part of your journey is where you’ll start to feel an energetic shift as the winding road takes you past desolate, rocky land peppered with ancient Kasbahs, villages, palm trees and Berber people living a simple life, on the land. Surrounded by the Atlas Mountains and Anti-Atlas mountain range, you’ll notice the feeling of calm as you drive far from City life and into lands with daily culture carried over from the ancient time. We’ve suggested you stay here for 2 days because 1 isn’t enough to experience the feeling you’ll get here. It’s like you’ve stumbled upon ancient land, where life is simple, the people are warm, technology and the stresses of a modern life can leave you behind. We personally loved Boulman Dades, Tamellalt as it’s right next to Gorges Dades. After you’ve checked into your accommodation, give yourself time to sit. Listen to the silence and the occasional bird or wind in the trees. After you’ve rested, take a tour of the local area, where you’ll see multiple fruit and nut trees and corn fields where women are carrying stacks of husks on their back. This is the valley of the fig trees, but you’ll see walnuts, almonds, and peaches too. It’s best to take this trip with a guide rather than venture off alone as the terrain can be rocky and you’ll come to points where you have to cross a flowing Oued Dades stream to get to the other side of the gorge at points. Wear sturdy shoes to protect your feet and carry water and a picnic, if you can. Walking through the oases area near the river is really lovely. As mentioned if you can go with a guide and pre-arrange a picnic here it will be a very memorable experience, especially if you enjoy the outdoors and want to connect with nature. Rustic is likely the best way to describe the experience but if you’re willing to be open minded you’ll be rewarded. Back in your accommodation, look forward to trying to see the Milky Way star constellation at night. You’ll see the clearest sky and stars here with a silence that really stirs your spirit. Read our guide to Touring the Todra Gorge and Dades Valley. A beautiful hotel with great views of the Dades Valley. Located near Kelaa’t M’gouna you’ll want a 4×4 for easier access. A newer hotel in the area situated right on the river with an on-site restaurant and plenty of great views. In the Todra Gorge this hotel offers a pool and onsite tents to relax during your stay. For some, the Sahara is the highlight of their trip, a landscape far from your every day. A chance to see nomadic living in its purest form. Sadly, the popularity of tourism here has meant that even the Sahara is urbanizing, with modern street lights in place in some areas, and more camps and hotels than before. You can choose from two extremes of the luxury camp or basic camp experience or even a hotel, if you prefer. The two main areas to choose from are Zagora/Erg Chegaga and Merzouga/Erg Chebbi. 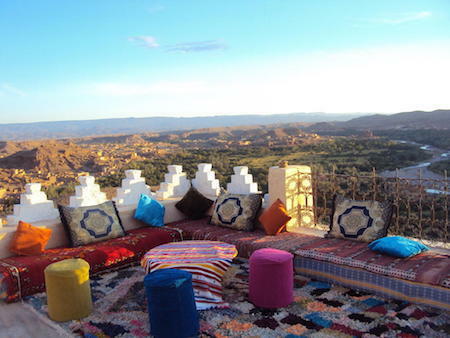 We imagine that when here, you’ll want to do what you’ve envisioned, ride a camel across the dunes, sit by a campfire at night, listening to Berber stories and sounds, and watch the stars at night. This is a giant playing field for you to immerse yourself in your own journey and story in this time. 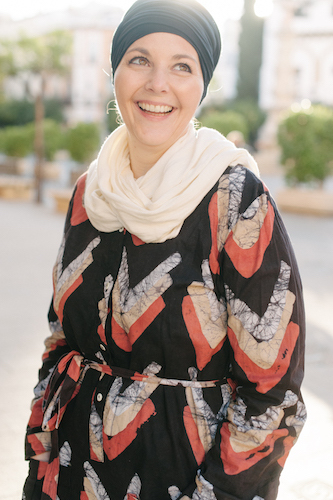 We’ve already put guides together for you What to Wear in Morocco: Sahara and Why Luxury Camping is the Only Way to Go in the Sahara (in my opinion)! Honestly if this is a once in a lifetime experience for you, don’t skimp on this part of the trip. You’ll want to be comfortable when you sleep and with the food you eat so good for a higher end option. You can choose to spend one night or two nights in the desert depending on what you prefer. The drive direct back to Marrakech will take most of the day – it’s about an 8 to 10 hour drive so keep in mind you’ll lose a day in transit. There are also now flights from Zagora to Marrakech on Royal Air Maroc if you prefer a faster way. The flights don’t go every day so you’ll need to check this when planning your itinerary. 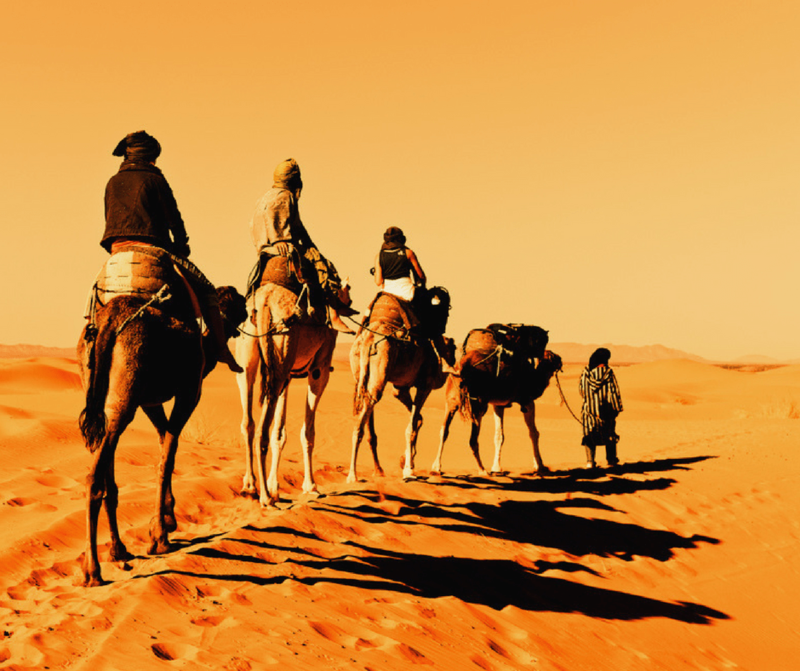 By now, you will have experienced the sensory awakening and diversity of the medinas and souks, the oceans and mountains, and the Sahara sands. On this long drive back to Marrakech, you’ll have the chance to let it all sink in. On your last day and night in Marrakech, this is a perfect time to take a hammam and spa treatment if you’ve not had one already, and shop for the gifts you want to take home. If you’d prefer to have your last memories of the country to be calm and reflective, you could just rest in your accommodation and leave the shopping trip for next time. 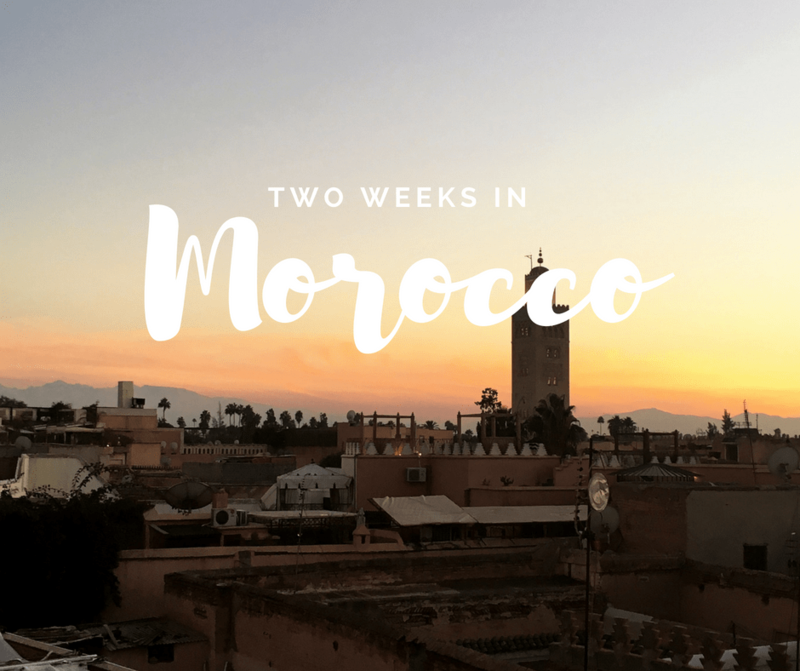 Planning (or thinking of planning) a trip to Morocco and not sure where to start? Join our FREE 3 day planning challenge and you'll be on your way to making your trip become reality!